Feta must be one of the world’s oldest cheeses, it’s certainly one of the most famous, and it’s practically never missing from a Greek table, no matter the time of day. A person might grab a chunk of this chalk-white substance for breakfast, crunch through layers of feta-stuffed phyllo for elevenses, put a slab of it on her village salad for lunch, have it for supper along with a vegetable casserole and then pair it with watermelon for a scrumptious dessert. The only other food that a Greek may be even more addicted to is bread. If you were to guess which nation boasted the most cheese eaters on the planet, surely you would say France, home to so many delectable and sophisticated fromages. Not so fast! Ilias Mamalakis, in his lively and informative dissertation on Greek Cheese, published in 1999, claimed that Greeks gobbled up 23 kilos per person, whereas the French ate a whole kilo less. More recent (Greek-sourced) data raises that figure to 25 kilos, almost a pound a week. We don’t know what’s behind this tyrochauvinism (tyri is the Greek word for cheese), but whatever the true facts may be, one is incontrovertible: despite being able to choose between a very large selection of at least 76 domestic soft, semi-soft, hard, semi-hard, fresh and brine-aged cheeses, the Greeks overwhelmingly prefer feta. It accounts for 40 percent of cheese sales. 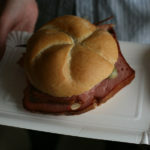 And it also tops export charts – foreigners, especially Germans, Brits and even Italians seem to love it too. 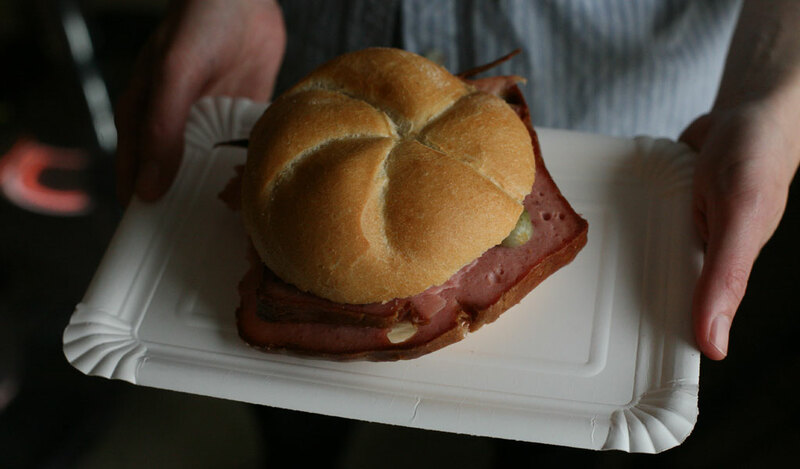 One reason for its popularity may be its adaptability, another that its taste – usually salty and slightly sour – is neither bland nor too pungent, and that it complements other foods. As many scholars have noted, the cheese made by the fearsome Cyclops Polyphemus in Homer’s Odyssey was most probably the ancestor of today’s feta. 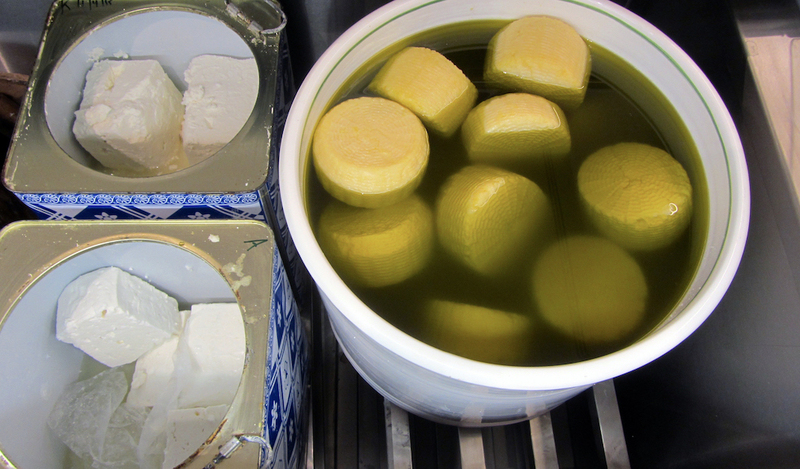 To begin with, feta is a curd cheese made with ewe’s milk, sometimes mixed with up to 30 percent goat’s milk, never cow’s. Although this was the standard recipe for millennia in Greece, sheep and goats being better adapted to the country’s rugged landscape, production guidelines and definitions were established by Greece in 1988 and by the EU in 1996. 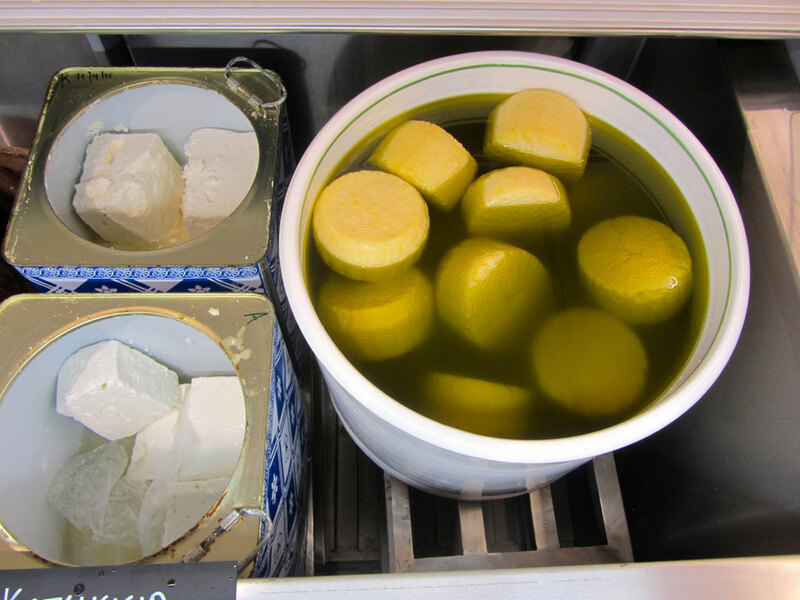 In 2002 the EU finally recognized Greece as the only member state entitled to call its white brined cheese feta. The Danish imitation made with cow’s milk had to change its name. Although Homer has the Cyclops thickening his milk, he doesn’t say with what. Would he have known about rennet, which comes from the enzymes in the lining of a suckling lamb’s stomach, or would he have used fig sap? Lemon juice, another thickening agent, is out of the question since the fruit hadn’t been introduced to Greece yet. Feta may be a generic name but there is not just one feta. 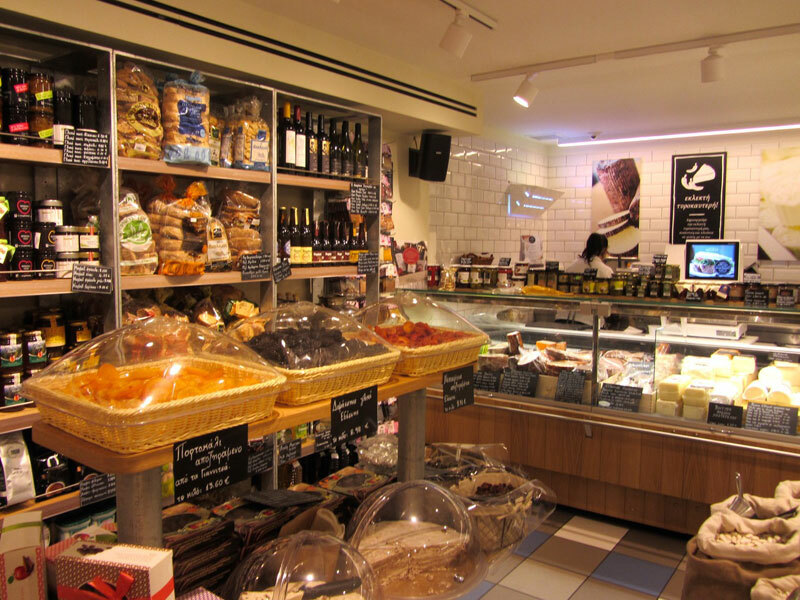 Wishing to find out more about modern feta, we paid a visit to Kostarelos, a cheese emporium/deli/all-day snack restaurant that opened in September 2015 in the Athens district of Kolonaki. 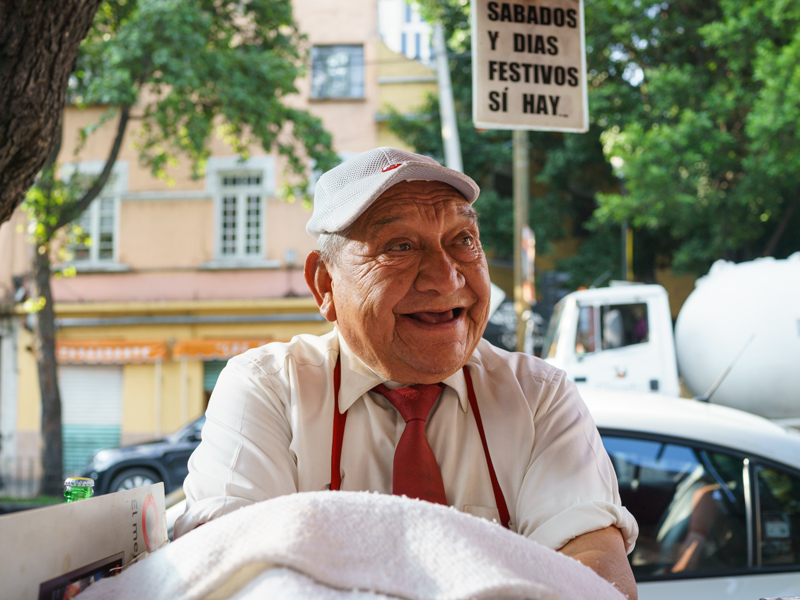 What differentiates it from others of this genre is that the Kostarelos family have been making cheese since 1937. 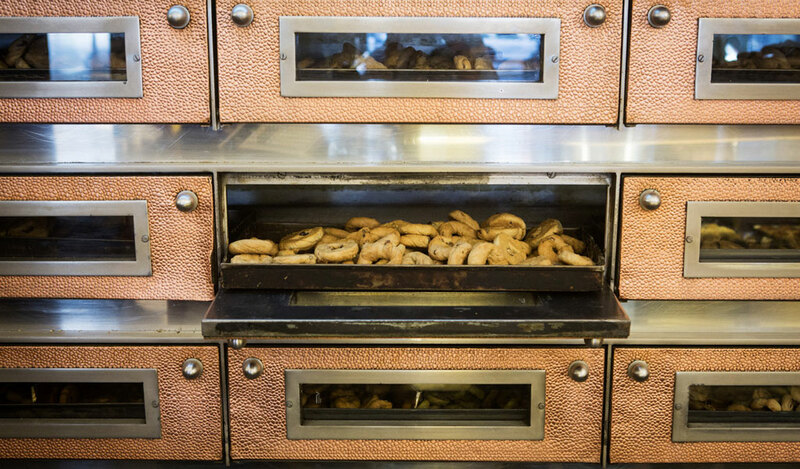 Like so many family-run businesses in Greece, it began with a passion. As Kyriakos Kostarelos told us, his grandfather, for whom he is named, had a taverna in Markopoulo, a small town in Attica just beyond the present airport. They kept sheep, and he made fresh cheese and yogurt for his customers. One of his seven children, Christos, Kyriakos’s father, wanted to devote himself to cheese full time, so his dad built an annex next door and bought him some large cauldrons to get him started. 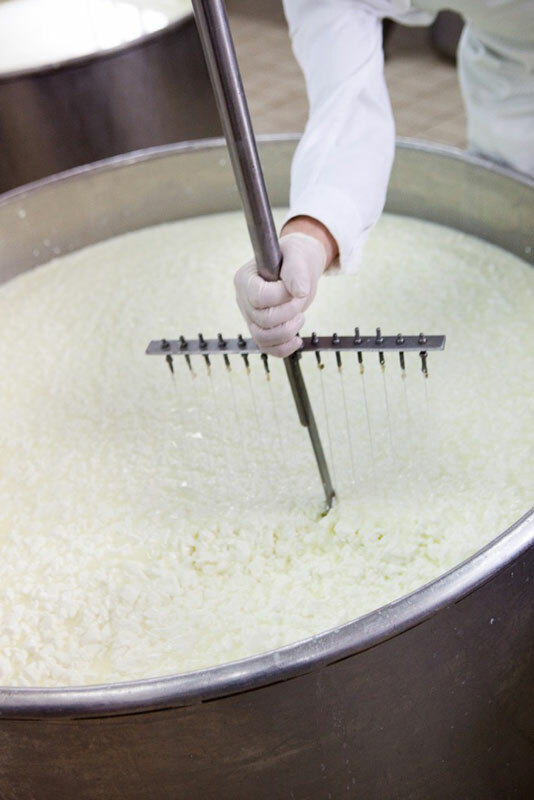 The current Kostarelos plant outside Markopoulo dates from the 60s, where Christos, still passionate about cheese, now presides over the making of 14 different kinds, plus three types of feta, as well as yogurt, rice pudding and custards (kremes in Greek). They no longer have their own flocks but source their ewe’s and goat’s milk from free-ranging flocks with reliable herdsmen in southern Evia. More surprisingly, they still use the original “prescription” for rennet. It’s homemade, handmade and secret. After the milk is thickened with rennet at temperatures ranging between 24 and 36 degrees Celsius, it is poured into molds (think giant colanders) for the whey to drain out (fresh cheeses like anthotyro and myzithra are made with the whey), then salted and left to rest in a cold room for a while before being put into wooden barrels filled with brine. Aging cheese in brine was a good solution for warm climates, as the salty solution prevents the formation of undesirable bacteria. 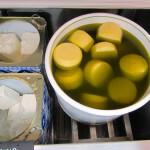 Nowadays the barrels are kept in refrigerators, and by law feta must not be sold until it has been steeping for 60 days. Usually you can ask for soft (malakí) or hard (sklirí) feta at cheese counters, the soft is creamy and milder, the hard (a bit older) is sharper and drier, but until we’d tasted Kostarelos’s feta, we hadn’t realized what a nuanced product it could be. The soft feta was almost like a spread, much softer than what we’re used to, ideal for sandwiches and tasting the herbs and greens the sheep had been feasting on. But then Kyriakos brought out two more plates, feta aged six months and 12 months. The medium-hard cheese was delicious but the year-old feta was a revelation with its many levels of flavor. We kept taking a bit more, rolling it around our mouths, savoring every molecule. We had no idea feta could taste like this. This is an artisanal table cheese that could easily hold its own on a platter with Brie and gorgonzola. 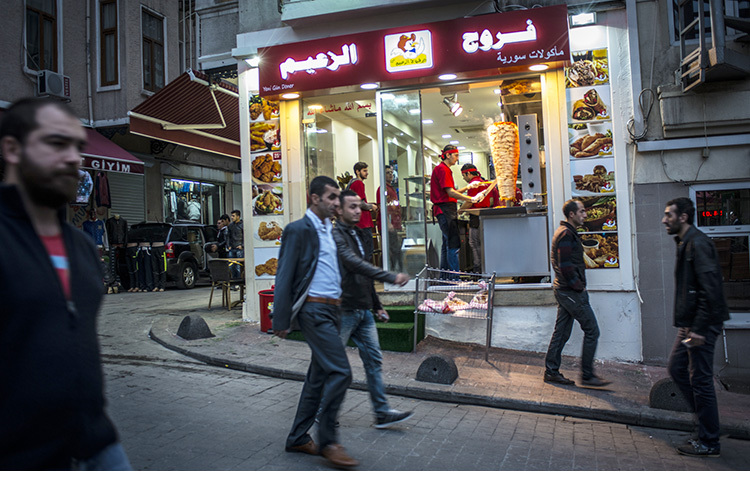 It must be eaten on its own, not fried, stuffed into a pita or crumbled on top of a plate of stewed string beans. And why not? We had allowed familiarity to breed contempt – well, not exactly, but perhaps to camouflage the possibilities of this cheese that may be too ubiquitous for its own good. 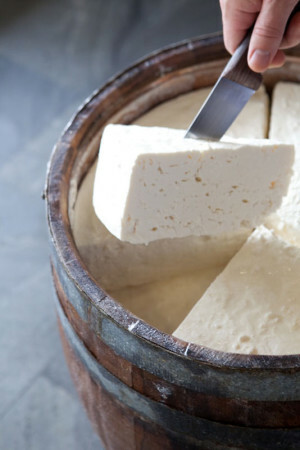 For the sake of convenience, we so often just buy prepackaged, factory-churned feta from the dairy section of the supermarket, not even bothering with the options of the cheese counter where the queues are often long. Kyriakos Kostarelos taught us a lesson. Feta may be a generic name but there is not just one feta. 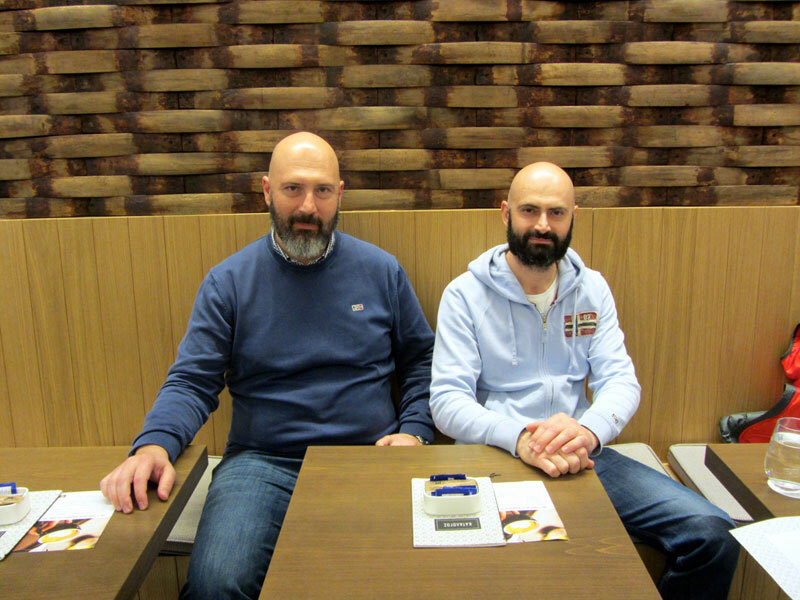 And while his father may still run the company, he and his brother, Nikos, both tall young men with beards and shaven heads, have been “making cheese since we were kids.” They have taken over marketing duties and opening new shops. “We have traditional recipes, of course, but we’re also in the process of inventing new cheeses to make the old ones more interesting,” like maestyri, which comes in very small rounds studded with pepper and savory, or pinakotyri, which melts divinely and is ideal for pizza. 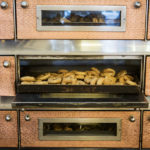 So if you happen to be in Athens, do treat yourself to a tasting session at Kostarelos, which has a large selection of cheeses from all over the country in addition to their own, as well as other products from small producers, from herbal teas to smoked meats, homemade pastas to jams, sauces and sweets. It is also an attractive place to grab a bite and a glass of wine. 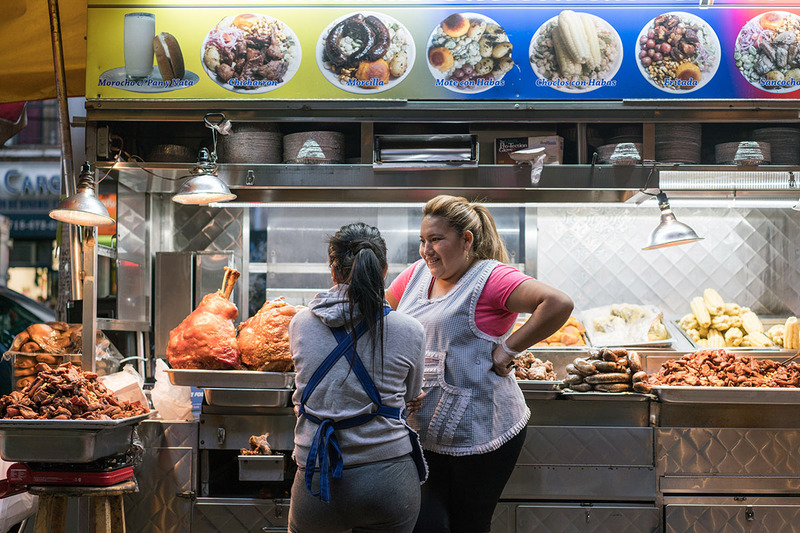 The menu – like a small catalog – was devised by a well-known chef, Chrysanthos Karamolegos, and has dozens of selections of tempting salads, dips, hot and cold sandwiches and platters of cold cuts and cheeses, at extremely reasonable prices. We are going back the next chance we get to have another bacon, soft feta and grilled mushroom combo, if we don’t succumb to the avocado and manouri, kasseri with arugula pesto, or roasted vegetables with anthotyro, just for starters. The menu comes with a glossary, so the names will not just be Greek to you. Even the décor is innovative: the walls are lined with barrel staves, adding the warmth of old wood and the artful play of curved surfaces. But if you cannot visit Kostarelos in Kolonaki or the other shops in Markopoulo, Porto Rafti, Pallini or Vrilissia, don’t forget that every region in Greece has its own distinctive feta. In fact, the feta from Macedonia, Thrace, Thessaly, Central Greece, Epirus, the Peloponnese, and Lesvos have all been awarded PDO (Protected Designation of Origin) status by the EU. Yet another reminder that feta, a pillar of Greek culture and cuisine that is older than the Parthenon, isn’t just another slice of any old cheese. Editor’s note: Our recurring feature, Building Blocks, focuses on foods and ingredients that are fundamental to the cuisines we write about. This story was originally published on May 9, 2016.